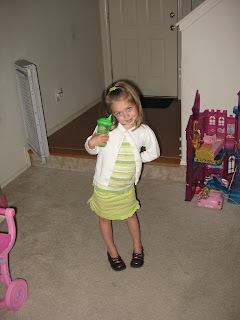 This past week I've been talking about St. Patrick's Day with Jaeden and told her how we get to wear green. 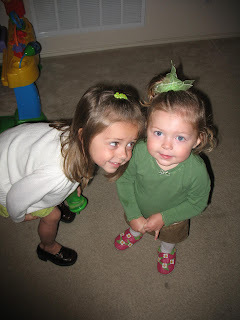 She woke up this morning very excited to put on her green outfit and wanted to invite her friend Tyler over to see if he was wearing green too and if he wasn't she wanted to pinch him. I should have left that part out of our St. Patrick's Day discussion. Well growing up my mom always made us green eggs or green waffles for breakfast. 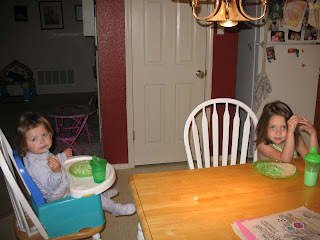 I thought I would make the girls green eggs and give them green milk. Well they both sat down and just stared at the food afraid to eat it. Jaeden declared she wasn't hungry anymore and wanted clear water. Avery finally ate it all. I put my green workout shorts on for the gym and as we were walking out the door Jaeden says, " Mom your a little strange but I like you." I guess I've succeeded as a parent! I hope you all have a great St. Patrick's Day!! Oh that is great!! Jaeden fineally knows the truth about her mother!!! We love our strange and hilarious Angie!! Oh and her hot green workout shorts-woo hoo!!! what a great mom you are...i didn't even realize it was st. patrick's day and didn't do a thing...oh wait- we did eat the green cupcakes you brought us! see you even helped us celebrate the day :) you rock! I love it!! Jaeden is so stinkin cute! You are the best strange there is!! What a cute mom you are! !